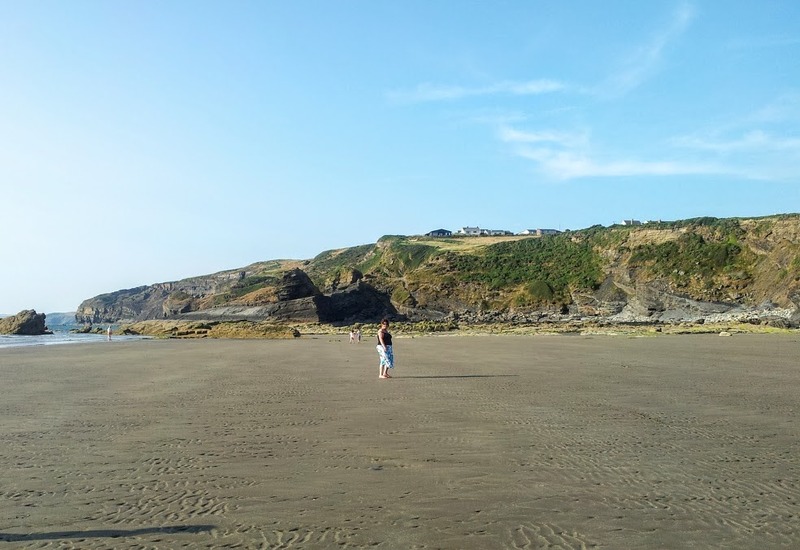 One of our favourite local beaches is Broad Haven beach in Pembrokeshire (not to be confused with Broad Haven South which is close to Barafundle Bay). There is a large car park and parking is free at the moment during the out of season months (December to March). Between April to November it costs £5 for over three hours. In the summer, this is money well spent for a lovely long day on a gorgeous sandy beach. The tunnel leading onto the beach always fascinated me as a child. I wanted to go through it, but never did. Now this is Danny’s usual route of getting onto the beach. It was a cold and rainy day. Rebecca stayed home to bake with Dave. She’s been asking to bake for ages and we promise and then it’s the same old story- we run out of time. We often say that we’ll do some baking or craft after a day out, then get home so cold and wet so we prefer to cuddle up and watch a movie instead! Therefore, it made sense for me to go out with the other three so they could bake in peace. It’s like Pembrokeshire’s very own Sphinx! The kids played by the puddle and stream for a little while. Danny likes to bounce back and for along the tunnel walls like he’s on Ninja Warrior. They attempted to dam the stream. They also jumped back and forth over the stream, waded in the stream and down to the sea. This is most fun when barefoot in spring and summer. We didn’t bring a bucket and spade but the sand was wet and perfect for digging and building sandcastles. Caitlyn is never without a football at the moment (it needs to be pumped up actually) so they started rolling the ball down the stream. The sea was quite wild so I did remind them that if a gust of wind carried the ball all the way down to the sea just to let it go but thankfully it didn’t go that far (the tide was way out). Danny and Caitlyn hopped over the stream to the rocks and caves side of the beach. We walked down toward the sea as sometimes there is a shallower flow of water to walk through. On this occasion, it wasn’t the case and we still had to wade through quite a bit of flowing water to cross over. This was fine and fun of course but we should have worn wellies rather than boots. I told the kids how high and how far out on the rocks they could go (and hoped they would listen! ), then off they went rock climbing. In the summer we follow the rocks all the way around. It’s thrilling to stand on the rocks as the wild waves crash over. Danny was really good helping Izzy on the rocks. They all came back safe and then made our way to the concrete steps. It gets so windy on the beach so I felt like a fish wife shouting out instructions to the kids, but I had to remind them that the top of the steps is close to the road and also to take care on the steep steps. The ball was taken out to roll again, this time down the rocks. Next we went to explore the deep, dark cave. I must remember to take a photo from the inside, looking out next time. Then we were back to a game of kick about- always a good lesson in taking turns for the youngest! Through the tunnel you can spot the public toilets. These are closed during winter time but will be open during the peak season. Spying Danny through the tunnel. We made our way carefully across the road back to the car park and home to get warm again. Dave and Rebecca had cooked us vegetable stew with herby dumplings-the perfect food to refuel us. This was followed by the results of their baking, their chocolate cake- perfect on a Sunday afternoon with a cup of tea. Broad Haven is quiet over winter, but gets busier during the warmer months- you will always find space to play though. It’s popular with dog walkers – lots of lovely dogs came up to say hello to us during our time here on Sunday. We loved watching them have a quick swim in the overflowing rock pools. Just remember that dog restrictions apply to the northern third of the beach between 1st May and the 30th September. Always remember to check the tide times before you visit to make sure you don’t get cut off during your visit here- this very nearly happened to us during a Brownie School camp when I was younger. There are lifeguards patrolling this beach between June and September. Have you visited Broad Haven beach?